Villa Aurora is brand new for the 2016 season and with some of the best views on the island will be a hot favourite amongst our clients. On the first floor the villa has 2 bedrooms both with private balcony's, 1 double 1 twin and a well equipped tiled bathroom. The ground floor has a separate cloakroom and is a large airy open plan space with a modern kitchen dining area and living room. All doors and windows have mosquito screens and air conditioning is provided in all rooms free of charge as is high speed WiFi, a TV DVD and a stereo system are also provided. Large french doors lead out to the pool deck furnished with loungers umbrellas and a dining table with seating for 4. Fantastic views of the dramatic coastline seem to go on forever and seem to change every time you lift your camera. Private parking completes this outstanding property all we need now is you. Villa Aurora is a 5 star location we where so impressed on our arrival. The villa as stunning views of the bay of Agia Effimia. Top snotch location if you prefer being out of the hustle & bustle of it all. Daily attraction is the goats moving down the hill side around 10am in the morning then returning around 1pm @ there bells ringing away. The ground are loverly private pool, remote “yes” stress free though so as you can relax,enjoy your break. Thanks for a great break too location we will be back. The villa itself was spotlessly clean and very well equipped. The view is even better than the photos. We had a a really lovely, comfortable stay and really didn't want to leave. We shall be booking again. Really close to Agia Effimia (car is needed) for shops and restaurants. Great location to explore the whole island with Myrtos, Asos, Antisamos, Fiskardo not too far at all. I can't imagine anywhere better. Daily visits from the goats were a highlight!! Many thanks for the great review, so pleased you had a great time and the villa was all you needed. We look forward to welcoming you back to the island in the near future. Stunning view with fabulous outdoor space. The villa was very well equipped with everything we needed. We were very impressed with the high standard of bedding, linen and cleanliness. The mosquito nets on the windows and doors are a great idea. Also while we were there the lovely owners installed a electric awning to provide additional shading which was great for outdoor dining. The location gives you the stunning views, with Agia Efimia easily reached by car or by local taxi (at a very reasonable rate). We can’t praise the standard high enough and we will definitely return. So pleased you had a great time and the villa was all you expected it to be, we look forward to welcoming you back in the near future. The views and outdoor space are outstanding. Any concerns that this would be a relatively small villa internally were dispelled by how thoughtfully and comfortably it has been furnished and equipped. It has been built to a high standard and is kept immaculately clean. My only suggestion would be that it could do with a little more built-in outdoor shade other than the parasols, which haven't fared well in the breezes. We had a really lovely time and would certainly recommend it. Really pleased you had a great time at Aurora and a permanent shade arrangement is being put in over the winter. Fantastic location! Views amazing. High spec accommodation with pool and terrace the highlight. 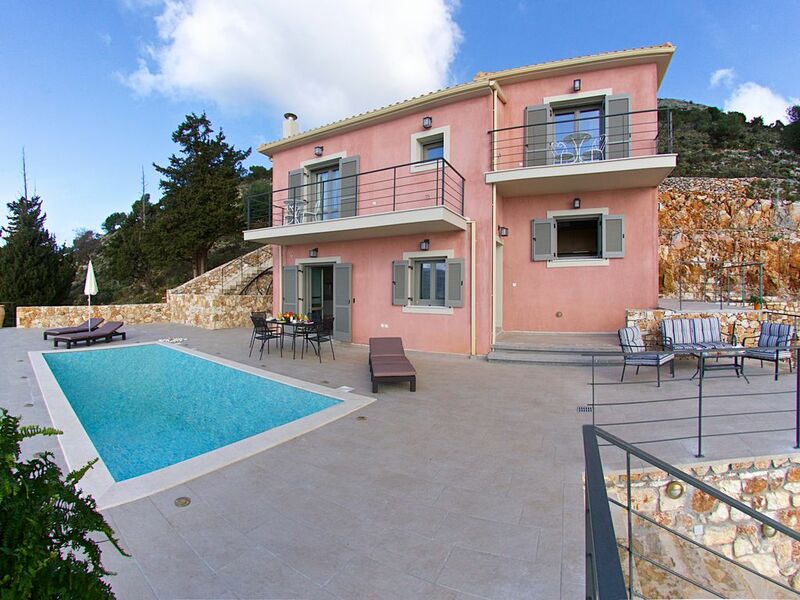 Great property perched above one of the prettiest towns in Kefalonia. Owners were on hand and did a thorough clean mid week. Not for the immobile or for those that want to walk everywhere. You need to drive - even for a coffee. Great running - if you like hill climbs! I'm so pleased you had a great time at Aurora, the views really are something else. We had a great holiday in Villa Aurora. We enjoyed the pool and waking up everyday to glorious weather and beautiful views. The house was immaculately clean and equipped to a very high standard. Thanks to the owners and Greek Island Retreats for all your help in making it a wonderful stress free holiday. I am so pleased you had a great time in Aurora and we hope to welcome you back to Kefalonia in the near future. Villa Aurora is located on the hillside directly above the quaint harbour of Agia efimia. Outstanding views down to the harbour and across to the town of Sami gives this villa in my opinion some of the best views on Kefalonia. Beaches restaurants and bars are just 5 minutes away along with a selection of markets selling local produce.